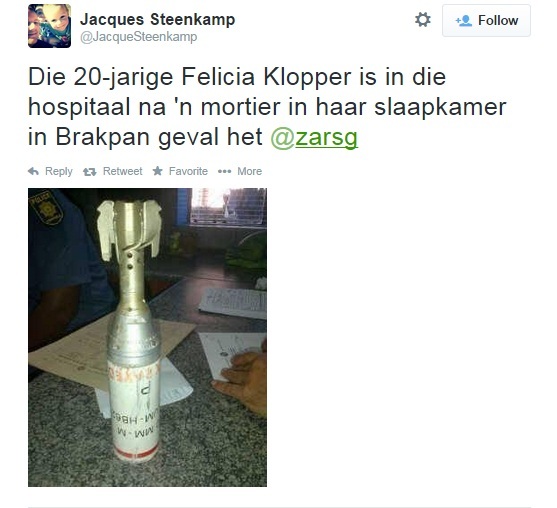 A screengrab of a tweet showing the mortar posted on Twitter by @JacqueSteenkamp. An attempted murder docket has been opened at the Brakpan police station after a mortar projectile crashed through the roof of a house, injuring a young woman. The woman had been identified as Felicia Klopper, 20, who lives along Derby Avenue, according to Brakpan Herald. Klopper had sustained a fractured skull and an injury to her shoulder during the incident, which took place on Saturday at about 11am. Police said a docket in terms of the Regulating Explosives Act had also been opened, as investigations continue to determine who fired the explosive. Klopper’s mother Annelie said her daughter had been sitting on her bed drying her hair, when the projectile crashed through the ceiling. “The next moment we heard this loud exploding noise and the whole house shook,” she said. Klopper was transported to the Life Dalview Clinic, where she was assessed before being transported to the Life Glynwood Hospital in Benoni – where she remains in a stable condition. The bomb disposal unit later removed the mortar from the scene. Police could not confirm or deny whether the mortar projectile was part of the SA National Defence Force’s equipment until investigations were completed.